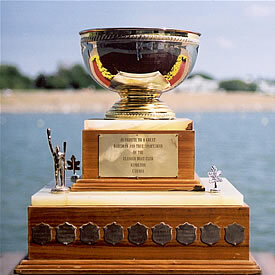 In celebration of "One Hundred Years of Rowing" in St. Catharines, the St. Catharines Public Library presents the Royal Canadian Henley Regatta Database, which features a database of trophies and second one of race results. Users are able to search and display Henley Trophy records, which feature an image of the trophy, background information on the trophy and a link to a high-resolution trophy image for the purpose of creating high-quality printouts. Race results records identify the winning crews, their club affiliation, the event name, winning race time, and the club affiliations of second to sixth place crews. All display fields on both databases are searchable and provide accurate trophy and race results data. By entering broad search terms into the race results database like race events or club names, the user is able to display results that span across decades of past Henley regattas. The scope of these results provides a new perspective on the historical significance of this regatta. The work on the database is ongoing and it will also include historical programs and photographs.